In an Institute for Public Accuracy news release earlier this year — “‘Fire and Fury’ — New Reports Thicken Trump-Israel Plot,” Ali Abunimah noted that author Michael Wolff “recounts an early January 2017 dinner in New York where Bannon and disgraced former Fox News boss Roger Ailes discussed cabinet picks. “‘Day one we’re moving the U.S. embassy to Jerusalem. Netanyahu’s all in,’ Bannon said, adding that anti-Palestinian casino billionaire Sheldon Adelson was on board too. Plitnick wrote the piece “John Bolton: The Essential Profile,” which states: “Bolton served as UN ambassador from August 2005 — when President Bush gave him a recess appointment after the Senate blocked his nomination — to January 2007. His resignation, announced in December 2006, came at the end of a controversial tenure marked by severe criticism from U.S. senators and international diplomats. His resignation also came less than three weeks after President Bush resubmitted Bolton’s nomination for Senate confirmation — the second time in six months. “As an assistant attorney general under Edwin Meese, Bolton thwarted the Kerry Commission’s efforts to obtain documentation, including Bolton’s personal notes, about the Iran-Contra affair and alleged Contra drug smuggling. 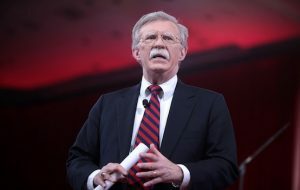 Working with congressional Republicans, Bolton also stonewalled congressional demands to interview Meese’s deputies regarding their role in the affair.” Mitchell Plitnick is former vice president of the Foundation for Middle East Peace.